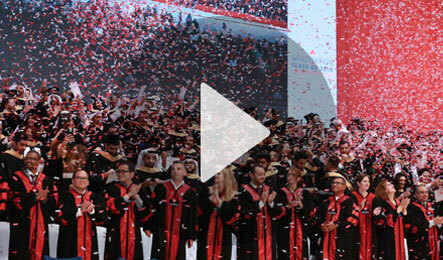 Dubai, April 14, 2019: Canadian University Dubai (CUD) paid tributes to 50 years of achievements of His Highness Sheikh Mohammed bin Rashid Al Maktoum, Vice President and Prime Minister of the UAE and Ruler of Dubai, at the University’s 9th graduation ceremony held at the Dubai World Trade Centre. February 4th, 2019: Canadian University Dubai has joined forces with the leading digital-tech institution Multimedia University (MMU) to establish a new platform for collaboration in higher education between the United Arab Emirates (UAE) and Malaysia. December 9th, 2018, CUD Campus:For the fifth successive year, CUD’s Faculty of Management played host to the students of HEC Montreal’s MBA program. HEC Montreal’s students are majoring in International Business. Their two week tour consisted of one week in Mumbai and another in Dubai visiting different companies and organizations each day. November 7th, 2018 Canadian University Dubai: A delegation of sixteen Senior Chinese executives attended a workshop entitled “UAE Investment Landscape” facilitated by the University in collaboration with Oriental Wise Educational Consulting FZ-LLC and delivered by the Faculty of Management. 22nd April 2019: Students from Canadian University Dubai got the chance to accompany His Excellency Dr. Thani bin Ahmed Al Zeyoudi, UAE Minister of Climate Change and Environment, on a two-hour educational tour during their recent field trip to Emirates Bio Farm in Al Ain. April 16th, 2019: A successful Market Day, organised by CUD Business Club under their President Mohammed Alshamaa took place on campus. It was aimed at helping small businesses and future start-ups owned by CUD students to showcase their enterprise to the university community. April 21st, 2019: Dr. Lakhdar Chadli, Assistant Professor in the Faculty of Communication, Arts and Sciences at Canadian University Dubai (CUD) has been selected as a member of the judging panel for the Zayed University Middle East Film Festival, taking place in Dubai this week. April 20th, 2019: Local High schools competed for CUD's Canada Cup 2019 under the direction of Mr. Dusan Popovic, Sports Coordinator in the university. April 17th, 2019: Canadian University Dubai (CUD) has become one of just 43 international education institutions around the world to be awarded the prestigious certificate of accreditation from the International Advertising Association – the only global association that represents all areas of the marketing and communications industry. April 17th, 2019: Three outstanding students from Canadian University Dubai have been placed in the top 20 entrants in a recent Pearl Initiative Case Study Competition staged for universities in the UAE. April 10th, 2019: Twenty international corporations and UAE-based companies have been seeking out the next generation of young professionals ready to make their mark in the regional workforce at the Canadian University Dubai (CUD) Annual Career Fair hosted on campus today. April 17th, 2019: Following on from the highly successful Innovation and Entrepreneurship Day Camp in October, in cooperation with INJAZ, two CUD students, Aliya Talipova & Ushna Balgobi were invited to attend a Job Shadowing Day at Bank of America Merrill Lynch (BAML) in DIFC. April 8th, 2019: A team of engineering students from Canadian University Dubai (CUD) has taken the runners-up trophy in the grand final of the 4th IET GCC Robotics Challenge following on from their success in the UAE qualifying round last month. March 26th, 2019: Canadian University Dubai (CUD) has announced the launch of a new Bachelor of Arts in Applied Sociology for students looking to train for the profession in the Arabic language. March 21st, 2019: Students representing the many cultures and nations that make up the Canadian University Dubai (CUD) family have gathered on campus in a range of activities to celebrate International Cultural Day. March 24th, 2019: Dr. Moayad Aloqaily, Assistant Professor in the Faculty of Engineering at Canadian University Dubai (CUD), has brought forward an innovative solution to the security challenges of smart city transportation in a research paper recently published in leading international journal, ‘Ad Hoc Networks’. March 20th, 2019: Canadian University Dubai (CUD) student, Nida Ali, is among a team of innovators that has developed a new smart-phone application to help combat cyberbullying among young people. The app and associated campaign was awarded first place in the recent MBC Student Hack competition, hosted as part of the Dubai Lynx festival of creativity. March 19th, 2019: In preparation for the Canadian University Dubai annual Career Fair on April 10th, the Career Services Department held a preparation day aimed at helping students get the most out of their interaction with employers. The event was organized by Ms. Naoise Lane, Career Services and Internship Coordinator, on behalf of the Department of Student Affairs. March 16th, 2019: A team of students from Canadian University Dubai (CUD) has qualified for the grand final of the fourth annual GCC Institute of Engineering and Technology (IET) Robotics Challenge, following its success in the UAE national heat hosted recently on campus. March 18th, 2019: Helen Al Uzaizi, CEO of BizWorld UAE and founder of the Entrepreneurship Education Platform for the MENA region, has spoken of her career achievements and how determination has played a large part in her success, in presentation to business students at Canadian University Dubai. March 17th, 2019: Two high profile speakers from the PR industry have shared their professional insights with an audience of CUD students and staff in the latest edition of the Faculty of Communication, Arts and Sciences Speaker Series. March 6th, 2019: The region’s top young talent in robotics will convene at Canadian University Dubai (CUD) next month for the grand finale of the IET GCC Robotics Challenge, which comes to the UAE this year for the first time in its history. March 6th, 2019: Medy Navani, CEO of Design Haus Medy has given a presentation on Speed Awareness for Brand Creation to an audience of architecture and interior design students at Canadian University Dubai (CUD). March 5th, 2019: Over forty students from High Schools throughout the UAE attended an Action Day held by the Faculty of Architecture and Interior Design at Canadian University Dubai (CUD).